Astrogeographical positions of capitals: Rome, Washington, Ottawa, Moscow, Beijing, London, Paris, Madrid, Berlin, UNASUR, EU, Kiew, New Delhi, Kabul, Riyadh, Bagdad, Tehran, Pyongyang & Seoul, The Hague, lslamabad, Damascus, Jerusalem, Athens, Ankara, Brasilia, Canberra, Caracas, Mexico City, Tokyo, Wellington. United Nations, Vienna, Warsaw. Astrogeographical position of Kabul for morphogenetic field level 1 which defines the supraregional, international situation and role of the capital and government of Afghanistan: The capital of Afghanistan is located at 11° Sagittarius and 20° Taurus. 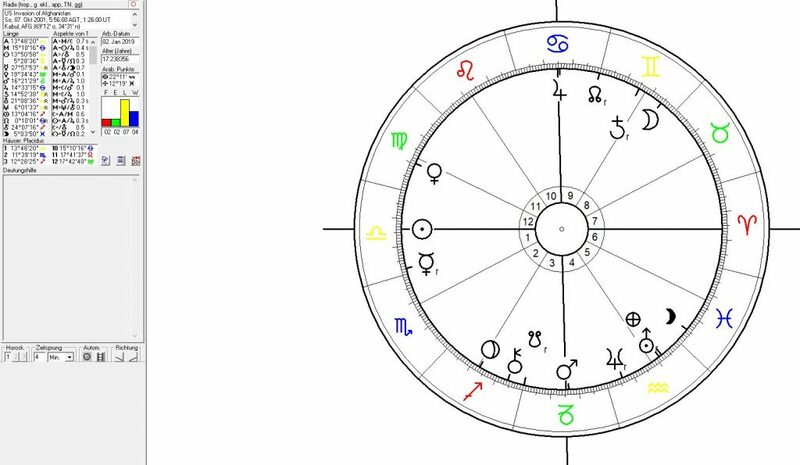 Birth Chart for the democratic post Taliban Afghanistan calculated 12:00 noon (exact time unknown) for the approval of the Constitution on 4 January 2004 by the 502-delegate 2003 Loya Jirga that had convened in Kabul on December 14, 2003. 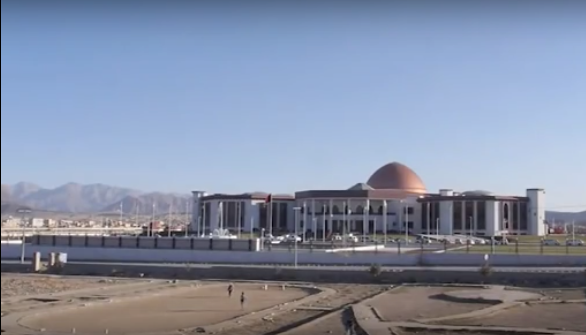 The democratic constitution was approved with Mars the planet of warfare in exact trine to Kabul`s 11°Sagittarius coordinate from 11° in fire sign Aries the sign of action, warfare, ignition, new starts in a highly positve aspect for the future development of the country`s readiness for self-defense. Neptune the planet of spirituality occupied the half sum between Mars and Kabul at 11°Libra in an aspect that stood for the integration of spirituality and true religion in the new constitution and probably also a highest amount of corruption and the even the influence from the drug producing criminal system that appears to dominate the country. That constellation reveals the full amount of compromise – false or not that the new political system has to rely on. The North Node was exactly conjunct the astrogeographical degree of Kabul at 20° Taurus the sign of agriculture, profitability and market places pointing at the ambition of consolidating the country`s territorial integrity. 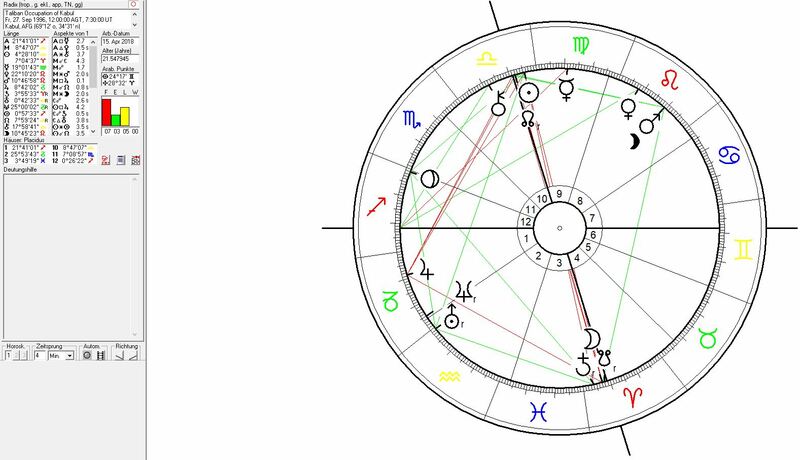 The last year saw an intensely challenging aspect for Kabul with Saturn transiting 20° Scorpio the point of opposition to the afghan capital (20°Taurus) between December 2013 and October 2014. Saturn`s transit over the position of Kabul at 11° Sagittarius will be effective from December 2015 until November 2016 and as an aspect of conjunction could to some extent introduce a momentum of stabilization at least to the capital area of Afghanistan. The next transit on the agenda will be Neptune moving over 11° Pisces in a square to the position of Kabul at 11°Sagittarius bewteen March 2016 and March 2018. This aspect of destabilization does surely not indicate support for the independence of Kabul. It can be interpreted as an aspect of manipulation and corruption particularly involving the drug production in the country. And as initiated through a square these influences may rather originate from abroad than from Kabul itself. The Transit of Uranus over the 20° Taurus position of the government of Afghanistan will be first triggered in July 2022 and will be fully effective until April 2025. Altogether there is the chance that territorial threats to the country`s independence exerted under the cover the pseudoreliegious, antispiritual, pseuodoislamic and neofascist forces could lead to a stronger need for self-liberation and solidarity among the population. The transit of Uranus in Taurus suggests the need for large scale economical, technological and social reforms. But of course the threat to the Afghanistan`s independence and stability could not be bigger than during a Uranus transit over the capital. Uranus could bring a revival of the russian sphere of interest and most probably more aerial attacks to fight back the Pakistani and Saudi-Arabian influence over the country exerted with the help of US strategical policies. The Taliban occupation of Kabul on 27 September 1996 began shortly after Pluto´s ingress into Sagittarius approaching the astrogeographical position at 11°Sagittarius. This event indicates a strongest sensitivity of Kabul to ingresses of the outer planets into that sign. Pluto the planet of dogma, ideology, hierarchy, role conduct and trauma stood for the hierarchical, antispiritual, fascistoid system established by the Taliban. Typical for Pluto was the replacement of spirituality and substantial religion by religious dogma. 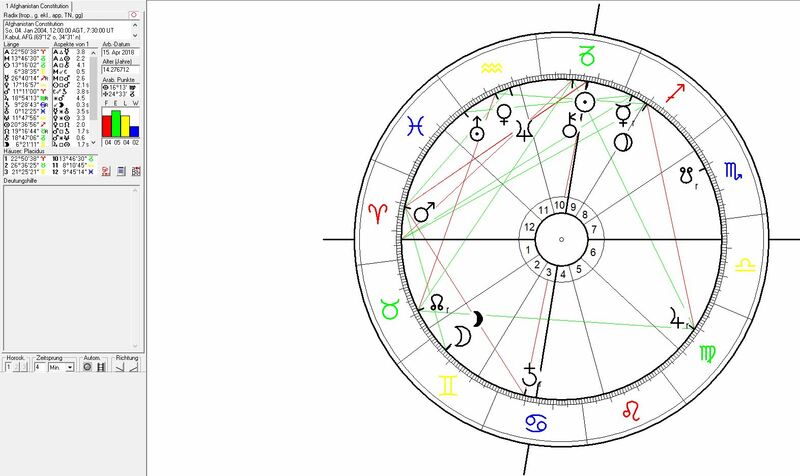 Astrological event chart for the US invasion in Afghanistan on 7 October 2001 the day of the first air strikes against the Taliban regime. The chart is calculated for sunrise. Operation Enduring Freedom. The invasion was preceded with the first airstrikes on October, 7 2001 while retrograde Saturn at 14°Gemini was approaching the exact opposition to Pluto the indicator for peseudoreligious ideology and neofascist patterns of gender role conduct at 13° in fire sign Sagittarius the sign of the priest castes, preachers and mental corruption. During the Fall of Kabul on 12 November with Saturn had reached 13° Gemini. Soon after Saturn reached the exact opposition to Kabul´s 11°Sagittarius coordinate by late November during the through the Fall of Kandahar before the Battle of Tora Bora ended the war by December 17 with Saturn at 10° Gemini.